Quirky little things these cars are and we all have our inner child that needs to be let out. 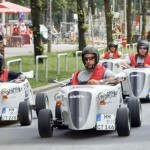 Thankfully, you can enjoy yourself to the fullest with our Hot Rod city tours and have the best 2 hours of your life. No, no, you are not here only to sit in this car, you will get to drive it yourself and venture the streets of the city with a full blown experience of a chauffeur this time. Cruise the city at your own pace, well, not that you can drive fast at astonishing 20 miles per hour in this. This whole trip will be about having a class, it is not like you are chasing for speed tickets on your Hamburg trip in your Hot Rod car.